It's been quite some time since Martyn Bates (Eyeless in Gaza) and Alan Trench (Temple Music, Orchis) have come together as Twelve Thousand Days. It's fair to say much water has passed under the bridge since their last album From The Walled Garden in 2006. Insect Silence follows a ditched compilation release with the same title scheduled for release a number of years back. Insect Silence continues with the folk based music provided by Alan Trench and fronted by the distinctive voice of Martyn Bates but Insect Silence more so than their previous albums doesn't dwell solely in folk music. It may be its starting point but Insect Silence differs with passages of psych guitar and its layering of synths and electronics, as well as in the ambient interludes which feature throughout and often open up the tracks way beyond its grounding in folk music. Lyrically Insect Silence is couched in an English familiarity and in the eternal themes of life, love and death. Just shy of 70 minutes it's a long winding path of 13 tracks involving a large assortment of instrumentation which are woven into a complex and intricate tapestry of sound. You will be surprised by the pathways Twelve Thousand Days roam on . Insect Silence opens to the spirited acoustic folk and percussive tambourine bashing of 'Death Went Fishing', outwitting death as it rushes onwards, weaving soaring psych guitars, which return throughout Insect Silence, as Bates implores that "he will return again". Its sets the scene for Insect Silence an album loosely based around folk music employing a rich multitude of instrumentation including guitars, dulcimers, harmonium, whistles as well as electronics. 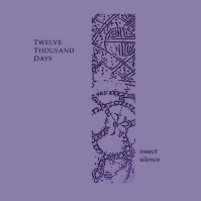 Twelve Thousand Days stretch the parameters of folk music with psych-guitar and ambient and instrumental interludes sprinkled throughout the 13 tracks. At times it likes listening to a Krautrock inspired psych-folk album with space rock leanings. In a good way, of course. Opening to an ambient interlude 'Mad As The Mist' is the first of three musical settings of the words of Irish poet W.B. Yeats. Dreamy folk guitars entwine twang and strum, as Bates in his pure folk tones recalls philosophers such as Plato, Homer, Tully and Cicero, swelling into another passage of soaring solo of psych guitar and back again to dreamy folk song. More restless psych-guitar features on 'A Coat'. There's more of an experimental edge to the Yeats setting here pitching Bates' strained (and occasionally treated) voice to the fore, embellished by the pluck of guitar notes augmented by glinting electronics, bass throb and a needling guitar casting vibrations of psychedelic proportions. 'Arrow', the final piece in the Yeats trilogy is starker and played more straightforward with the beautiful folk voice over ringing acoustic guitar and warm synth backing. Away from the Yeats tracks, a number of which Bates recorded with Troum in different musical forms, 'Errant Desires' moves to graceful ambience with flourishes of guitar notes. Bates' pure mournful tones add a sleepy lamentful melody, as faint electronics flicker behind the gentle flurry of guitar notes and assorted instrumentation. Beautifully atmospheric, it's one of my favourites on Insect Silence. Bates' voice is measured and melodic illuminating the sense of life passing in the evocative lyrics of rain falling, captured in our hands and gladly falling to the earth. More timeless folk arrives in the form of 'She Raises Her Eyes' where in captivating melodic tones Bates sings of a longing recalling long cold December months over duelling dulcimer chime. One of the more surprising tracks appearing in the first half of the album is 'Invoke Hecate' where over passages of whistle and rousing, beating strum, Twelve Thousand Days sounding not unlike Ostara invoke the Goddess of Witchcraft, through an assortment of occult techniques. Alan Trench in past endeavours has facilitated many musicians in the apocalyptic folk genre but this rare sojourn, even with it blistering psych solo, can still raise an eyebrow and something of a smirk. As mentioned earlier, Insect Silence is interspersed with instrumentals taking the music down alternate pathways, straying far off the beaten track. The first of these 'Night Harmonium' carries an air of arcane English mysticism with its loose folk stylings where strings chime and whistle billows merge over background synths and static clicks. The instrumental 'Old Ladies As Birds' is another brooding mystical moment where layers of whistles and flutes cast an age old melody over wheezing harmonium while loose guitar notes chime and ring out as distant electronics shudder underneath. While 'Old Ladies As Birds' is evocative of transforming souls and spirits, the jaunty folk offering of 'Fieldwork' is celebratory. Based on whistles and acoustic strum it comes across like a folk dance or Pagan procession. If 'Fieldwork' revels in a lost Englishness 'Descent' is dealing with nostalgia. A vintage crackling recording of 'See, The Conqu'ring Hero Comes' shrouds the descending organ scales of 'Descent'. Bates' voice is quiet, distant and softly murmured amidst the eerie disembodied voices of the choir as percussion rattles. You can almost picture the landscape on the pastoral 'Red and Golden Fire' another experimental offering mixing lulling electronics with whistles and flutes which closes the album. Insect Silence hinges around 'Pathless' an epic experimental 16-minute musical and lyrical journey which we all make on our travels through life. Set in the middle of the album it continues the theme first introduced on the opener 'Death Went Fishing'. With the huntsman at our heels, we try to outwit death to no avail. Travelling from ringing guitar with Bates' voice, wrapped in layered accompaniment, veering between passages of Krautrock electronics and wavering synths to psaltery, whistles and location recordings. All the elements of Insect Silence emanate from and come together on this track to great effect. As it flows together seamlessly it's difficult to pinpoint where 'Pathless Part I' ends and 'Pathless Part II' begins but it may be when a heartbeat bass pulses and acoustic guitars ring out and the spoken word of Lisa (I think this is Elizabeth S who features on releases from Eyeless In Gaza) surfaces amidst guitars and layers of spacey synths which lull, crash and wail, before Bates returns, to close this epic track in high registered tones.